How Google can make you financial independent? Home » Money & Wealth » How Google can make you financial independent? In world we find two types of people hard workers and smart workers. Hard workers work hard throughout life to earn money. It is very difficult for hard workers to become financial independent. These types of people are usually engaged in doing job from 9 to 5. On the other hand smart workers work very less yet they earn more money than hard worker & it is very easy for smart worker to become financial independent. People who are businessman, self employed or investors are smart workers. If you are hard worker and want to become smart worker this article is for you. 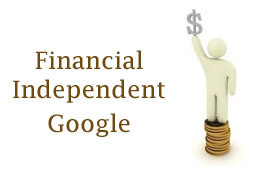 We are herewith details about how google can make you financial independent. First step in becoming financial independent using google is you need to run successful website or blog. You can select reliable hosting provider like godaddy or hosting.india.to for hosting website. Here you need to pay for two component domain name of website and hosting space. Prior to purchasing domain name and hosting space you must decide on which idea you will be hosting your website like blog, news site, classified etc. If your idea of website is unique you are likely to get success easily. Second step towards financial success is to apply for google adsense program. Once google approves your login you will able to place advertisement on your website. If someone clicks on these advertisements you will get revenue share from google. Earnings from the Google Adsense depends on a number of factors for example the type of ads, pricing of ads etc appearing on your pages. You might be wondering how these google advertisement can make you financially independent, well google adsense can earn you endless monthly income. Few success examples of people earning handsome income from google adsense in India are given below. Lagnol.org is number one blog run by Mr. Amit Agrawal. He is one of the top Indian blogger. He is computer science graduate and running this blog since 2004. He quits his job to become blogger. His monthly Google adsense income is $10,000. ShoutMeLoud.com is another successful blog. This blog is managed by Mr.Harsh Agarawal who quits his job from Convergys in 2008 to become blogger. He writes about blogging, SEO and technology. His estimated monthly google adsense income is $3000. Apart from this he is also earning very good money from affiliate network. Trak.in is business technology website. This website is run by Mr.Arun Prabhudesai. He started blogging in 2007. He writes about politics, stock market, finance and technology. His estimated google adsense monthly income is $800. Please check out Infographic of Top 10 Indian Bloggers of 2013 here. I am sure now you must be ready to become financial independent by google. Do you think one can become financial independent by google adsense?